If I walked up to you and said “Excuse me, would you mind if I give you a $100 bill in exchange for a $20,” you would probably look at me as if I was nuts, and then, after holding the $100 up to the light and checking out the watermark etc, agree to the exchange. 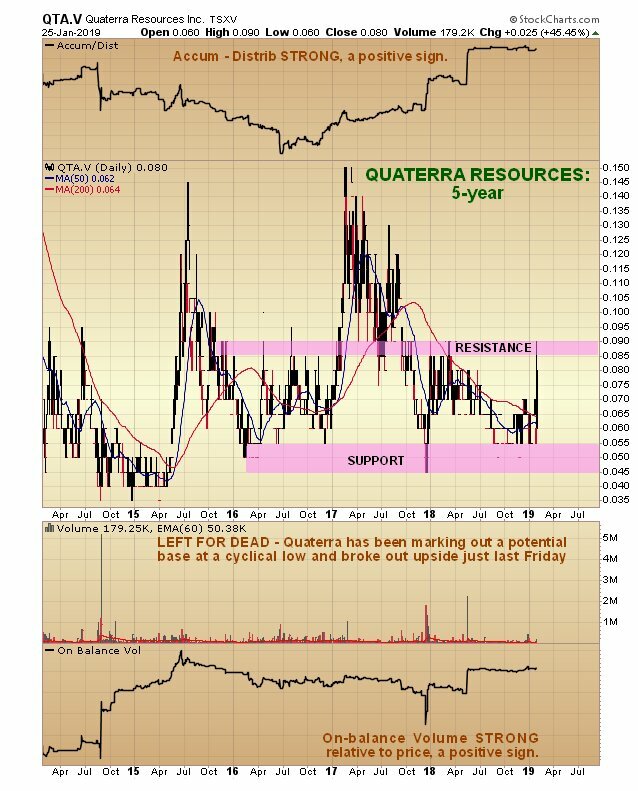 This is similar to the situation we have now in Quaterra Resources where we have a company worth 49 cents a shareand don’t take it from me, that’s Fundamental Research Corp’s fair value estimateselling at about US$0.06 cents a share. Alright, some things could theoretically go wrongthe check that the company is due for its recent sale of water rights or land with water rights for $6.23 million could bounce, Al Qaeda could poison their remaining water etc, but what are the chances of these things happening? 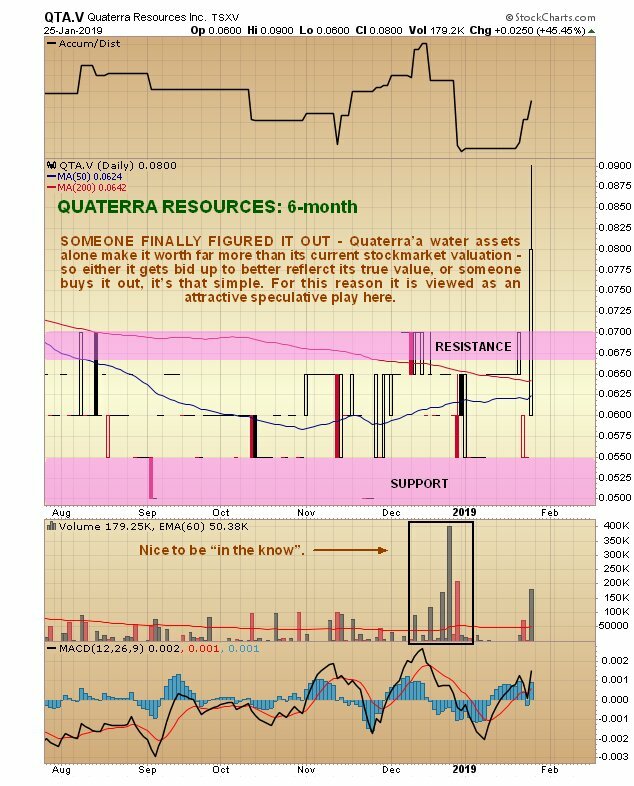  they are minuscule, and viewed rationally, the current valuation of Quaterra is just plain nuts. Let’s just consider some of these numbers briefly, because there is no need for us to get bogged down in needless detail. At the current stock price (8 cents) the company is valued at about $12 million, they have a check due for $6.23 million for a recent sale of water rights, extrapolating from which their remaining water rights can be fairly valued at $20 million, their copper projects are estimated to be worth a very substantial sum, so adding all this up, we have the company valued by the market at $12 million, while its assets have a total value in excess of $100 million, and that’s without taking into consideration that other mining companies surrounding their properties might want to buy them up, and without taking into account that the copper price could rise a lot from its current low level in the midst of a commodities bull market. 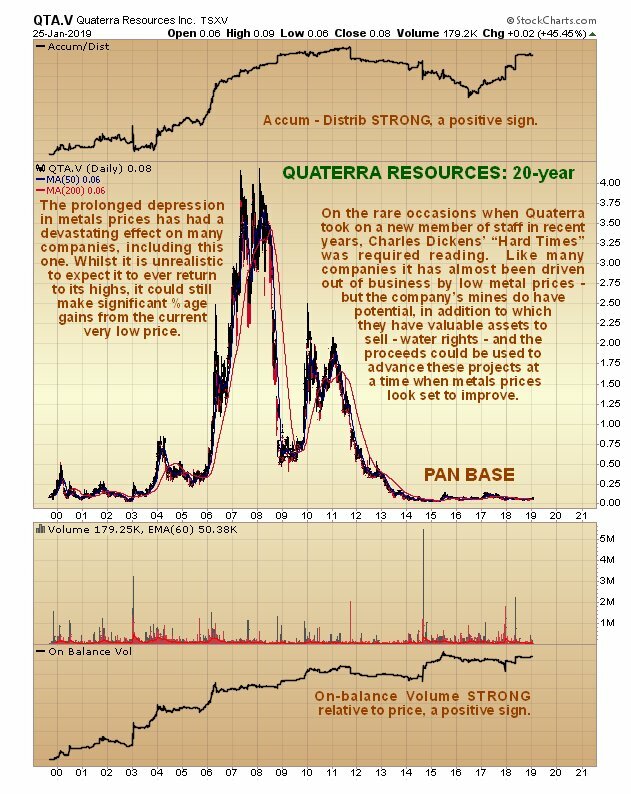 So this is what is known in the trade as a “no brainer.” It was market analyst Joseph Granville who said many years ago that “There is more maintained stupidity in this business than in probably any other business in the world”how right he wasand isand this undervaluation of Quaterra Resources is a classic example of it. Let’s now proceed to see what the charts are saying about it. We’ll start with the long-term chart which looks positively Dickensian in that Quaterra is now so cheap it clearly has to “make do and mend.” Whilst it would be hopelessly unrealistic to expect the stock to ever approach its highs again, it is clear that even if it only advanced partway towards them it would result in substantial percentage gains from the current dismally low price, and that is possible since the price isand has been since late 2014tracking sideways marking out a potential low Pan base. Volume indicators are positive, which increases the chances of a new bullmarket getting going.